A gamut of new generation trawler-style vessels will be in full force at this year’s Sanctuary Cove International Boat Show (SCIBS), with premier brands already on board for the fast-approaching 30th anniversary event. Trawler boats are charting a significant course at SCIBS 2018, held from May 24 to 27, with organizers confirming the largest display in recent years. Leading exhibitors to secure on-water space include Clipper Motor Yachts, Grand Banks, Flagstaff Marine displaying the Beneteau Swift Trawler, Fleming Yachts, Integrity Motor Yachts and Leigh-Smith Yachts with their Alaska brand, to name a few. Sturdy, full form and laden with features, SCIBS exhibition manager Dominic O’Brien said the trawler-style motor yacht is surging in popularity, prized as family-friendly coastal cruisers and liveaboard long-range passagemakers. “There is a real demand for trawler-style motor yachts thanks to their ‘go-anywhere’ capabilities, and there will be a huge variety of these modern classics on display this year,” Mr O’Brien said. “We are thrilled to welcome back several long-time exhibitors with exceptional new products this year, as well as some new brands making their Australian debuts. Grand Banks Yachts pioneered the ‘Downeast-styled’ yacht based on the New England-style American lobster trawlers with the introduction of the 38 Eastbay EX in 1995. Grand Banks CEO Mark Richards said the new Eastbay 44 (EB44) will be unveiled for the first time in Australia at SCIBS this year. “The Eastbay 44 fully delivers the best of both worlds, with all the comfort and style you appreciate in a Downeast yacht, but with the legs and cruising speeds to take your adventures farther and faster,” Mr Richards said. Great Southern Marine marketing manager Joel Butler said the company would be representing Grand Banks at SCIBS this year and will be launching the new Eastbay 44 (EB4). “This year marks the 25th anniversary of the Eastbay brand, and the Eastbay 44 is a stunning modern version of our distinguished line of Downeast cruisers, with fantastic performance, in a stunning and versatile package,” Mr Butler said. “The new EB44 combines an eye-pleasing blend of contemporary finishes and Downeast lines with an advanced hull design that is capable of safe and comfortable passages in open water. From Fleming Yachts Australia comes the new Fleming 58, which will make its Queensland debut at SCIBS. Fleming Yachts dealer Sam Nicholas said the 58 has been created to fill the gap between the 55 and 65, and by popular demand, has a full-beam master cabin below the pilothouse and an engine room with full headroom. “The 58 is a recent design, new from the keel up, and has been designed by Norman R. Wright & Sons in Brisbane whose expertise in designing semi-displacement motor cruiser hulls is unrivalled in Australia,” Mr Nicholas said. “The standard specification contains a multitude of items that would be optional with many other builders such as stabilisers, thrusters, twin anchor winches, davit for tender and much more, including digital switching, a full array of the latest Raymarine navigational equipment, and Twin Disc Joystick Control with the popular Position Hold feature, in addition to traditional electronic throttle and gear levers. Mr Nicholas said the appeal of this style of boat is its timeless design, which adds up to strong resale value, their stability in all sea states and proven seaworthiness. “The first Fleming 55 launched in 1985 and the design has endured,” he said. 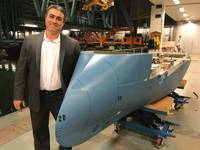 “Fleming produces proven sea boats. 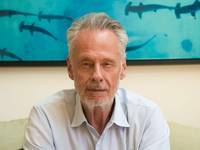 Company founder Tony Fleming has more than 60,000 nautical miles under his belt, cruising the world, circumnavigating Iceland and the Galapagos. Among its multi-million-dollar line-up, Leigh-Smith Yachts will have several trawler-style vessels on show, including the Hampton Endurance 720 and Alaska 44. Ryan Leigh-Smith said not only do trawler-style motor yachts have the volume to accommodate the extended family, pets and all your gear, they boast classic styling that never dates. “Trawler-style motor yachts aren’t faddish, which means better resale value,” Mr Leigh-Smith said. 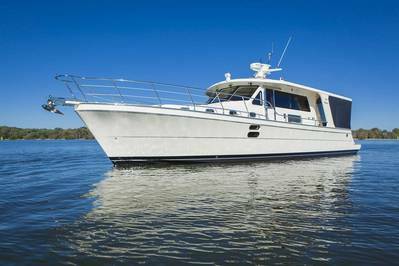 “The Endurance 720 is a superb long-range cruiser that’s ideal for people looking for a bluewater cruising yacht to take to The Kimberley or Tasmania and is even popular with those looking for a floating luxury apartment with the works to cruise the Broadwater, Sydney Harbour or the Whitsundays. Alaska is the Leigh-Smith’s own brand, which they design, deliver and manage after-sales service and warranty. Since 2004, they have sold 95 units and their belief is the Alaska 44 will be their most popular yet. “Alaska Motor Yachts offer a mix of tradition and technology. It’s absolutely boutique, high-grade quality with good range and all the inclusions people are looking for in a long-range cruiser – all this for under $1 million, because we cut out the middle men,” he said. The scarcity of pre-owned boats is testament to the Alaska striking a chord with its market. Making its Australian debut at SCIBS is the Beneteau Swift Trawler brand, with the 35 and 44 models presented by Flagstaff Marine. Made in France by the legendary Beneteau yard, Swift Trawlers have impressive pedigree based on 140 years of production and its history of building rugged power boats to take on the Atlantic Ocean. The previous 34 model sold more than 400 since 2003, and the new 35, which launched at Southampton Boat Show in 2017, will replace it. Flagstaff Marine dealer principal Graham Raspass said the trawler-style will always be popular with people looking for sturdy, stable and stylish cruisers. “The 35 Swift Trawler blends traditional lines with modern cues and is great for cruising to the Whitsundays and back, as well as the rivers, canals and islands,” Mr Raspass said. The 35 boasts large windows and a unique offset saloon so one of the walkways is wider and undercover for clear vision, easy access and safety when docking. 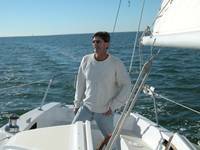 “She will do six to eight knots cruising and 23 knots if you need to get somewhere quickly,” he said. The Swift Trawler 44 is a larger version of the 35 – both offer full helms top and bottom and come with bow and stern thrusters. With all-new generation features and styling, Integrity Motor Yachts will have four models on display at SCIBS including the 320 Express, 340 Sedan, 380 Sedan and 440 Sedan. Integrity Motor Yachts general manager Peter Pembroke said the company was renowned for its proven seakeeping and efficiency, thanks to their proven displacement hull, class-leading beam, full-length keel and single engine setup with bow and stern thrusters. “Our classic trawler-style boats have struck a chord with boaties seeking value for money and hassle-free, low-maintenance, single-engine boats,” Mr Pembroke said. “SCIBS is such an important event for us, as it’s our biggest show for the year and it’s our home base. We’ve always achieved strong sales from SCIBS and it’s the biggest market for Integrity too. “This year is also special for us, as it’s the first year we’ll display alongside Whitehaven Motor Yachts who purchased Integrity in 2017. Since 2008, Integrity has sold 100 of its long-range cruisers, specifically designed for the Australian, New Zealand, US and Thailand markets, to astute boaties looking for value for money, economical and fuel-efficient boats that are safe, stable and single-engined for ease of use and maintenance. Clipper Motor Yachts will have 10 vessels on-water and is proud to host the world debut of the Hudson Bay 540 and Hudson Bay 390. Clipper Motor Yachts managing director Brett Thurley said the semi-displacement sedan models represent a new direction as designed by Patrizio Facheris Design Studio, based in Florida, USA. “Our heritage is in traditional, solid, trawler-style long range cruisers, and we have now modernised and taken that style of vessel to a completely new level of design and finish,” Mr Thurley said. Patrizio Facheris has more than 30 years industry experience and is renowned for its luxe design work on vessels ranging from tenders to state-of- the-art superyachts. “The new 540 is the flagship of the Hudson Bay sedan range and will combine the economy, safety and stability of semi-displacement cruising with the flair, styling and design of a world class sports yacht,” he said. 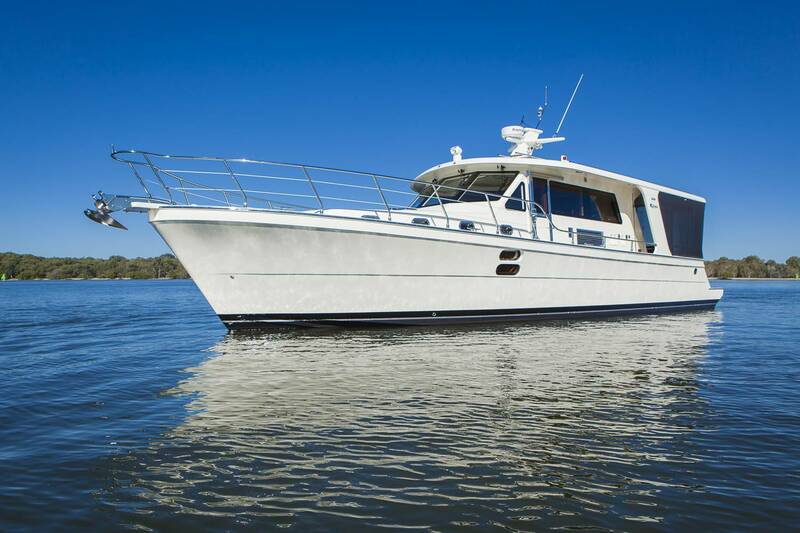 “These new models combine an entertaining layout for our Aussie boating lifestyle with proven bluewater ocean passage making keeled hull, diesel shaft drive designs.